La-La Land Records and Warner Bros. Animation proudly present the original score to the all-new DC Universe Animated Movie SON OF BATMAN. 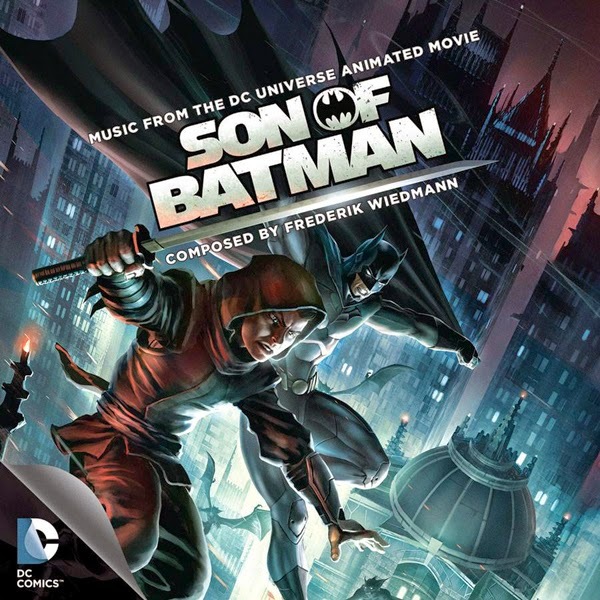 Acclaimed composer Frederik Wiedmann (GREEN LANTERN THE ANIMATED SERIES, JUSTICE LEAGUE: THE FLASHPOINT PARADOX) finds the perfect pitch for the Caped Crusader with a vigorous orchestral score that chronicles Batman's fight against Gotham crime with his son Damian (the new Robin). Wiedmann expertly mines both sides of Batman, musically capturing the complex character's heroic feats as well as his dark, conflicted psyche. Produced by the composer and MV Gerhard, and mastered by James Nelson, this limited edition of 1500 units contains two exclusive tracks not available on the digital download version. The CD booklet is infused with great pics and includes brief comments from the composer and the film's animation director. The Gotham-infused art design is by Dan Goldwasser.